During my short sabbatical from all things digital over the festive season, I visited some exotic, mesmerising places, supped on mouth-watering local fare, and immersed myself in numerous colourful cultural experiences. It was invigorating and fun but like always after a hard stint abroad, it is great to be home, because for me, there is no place like home. Therefore, to kick off the New Year and in readiness for our annual Aussie Day celebrations, here are a few picture books to stir up your patriotism. Nothing shouts Australia louder than sheep, blowies, and working dogs on bikes. I envy the ability the picture book team of Paterson and McGrath has at capturing the essence of the Aussie outback with such bold open sky appeal. 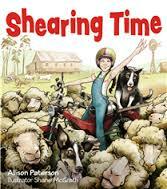 Colourful and engaging, Shearing Time begins during the school holidays with one farm girl’s exclamation, ‘I love shearing time!’ She goes on to explain why, inviting readers to share her shearing experiences from sunrise to sunset. Every aspect including herding cantankerous sheep, the arrival of the rowdy seasonal shearers, the racket and rumble of shearing time right up to the feeding of workers is ably depicted giving youngsters a realistic, close-up look of how wool is procured from paddock to jumper. The glossary of well-loved shearing terms is especially useful. A great focus on rural life and one of our most significant primary industries for 4 – 8 year-olds. Here is another picture book duo whose combination of imaginative images and engaging text I adore. Once again, there are strong visual and verbal connections with regional Australian life. 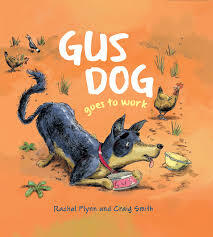 Chock-a-block full of colloquial language and ribald observation, Gus Dog Goes to Work is an excellent read-aloud picture book allowing carers to inject plenty of iconic Aussie swagger in their rendering of it. Gus is your typical sheepdog who exists only to work and please his owner, Tom. When he awakes one morning to find Tom and his Ute missing however, Gus decides to venture out on his own to work. His meanderings steer him a little off track and into some stinky, hilarious, quintessentially doggy dilemmas until finally he and Tom are reunited. Dog lovers aged five and above will get a massive kick out of this entertaining expose of country life from a pooch’s point-view. Bursting with more Aussie flavour than a barbie full of beef sangers, Gus comes highly recommended. This is a gem of a book that evokes considerable emotion; warm tears spring forth unbidden each time I read it. 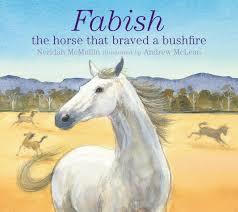 Based on the true story of the vicious bushfires that ripped through the Victorian bush in February 2009, this picture book introduces us to ex-thoroughbred racer, Fabish and his retired role as mentor to the younger flighty yearlings. McMullin faithfully recreates the mood and atmosphere of that scorching summer’s day when fire menaced the region. Fabish’s trainer, Alan Evett released the yearlings and Fabish fatalistically to find their own way while he huddled with the remaining stock in the stone stables. Outside a firestorm blazed out of control. He never thought he would see Fabish and the yearlings again. The next morning dawned charred and desolate. Not a single living thing remained and yet miraculously, through the choking smoky haze Fabish appeared leading his yearlings home. McLean’s raw rustic palette coupled with McMullin’s poignant interpretation of the tale is a beautiful tribute to human resilience, loyalty, the power of nature and a truly unforgettable horse. I grew up in the Adelaide foothills and witnessed the horrors of several summer infernos like Ash Wednesday but never experienced one first hand as author Adam Wallace did. 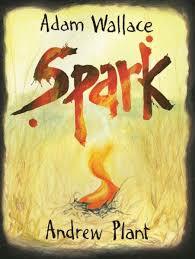 Spark is a fascinating picture book depicting Australia’s most recent and devastating bushfire event, Black Saturday but ostensibly describing the catastrophic destructiveness and formidable beauty of any firestorm. And, along with Plant, he does so indescribably well. Wallace succeeds with what no other has attempted before, to give fire a voice. From the uniquely omnipotent point-of-view of a tiny spark, Wallace characterises the burgeoning flame with an almost child-like persona, suggesting a helpless naivety that encourages an instant empathy. Together, with the growing flame, we are borne along with a capricious and irascible wind, intent it seems after at first befriending the flame, to cause as much upset as possible until all control is lost. Exhilarating and wild, terrifying and violent, Spark rips through your emotions with a mere sprinkling of words but with the force of an atomic bomb. Soul serrating language is not the only draw card. Plant’s monochrome illustrations will make the hairs on the back of your neck stand on end. Textural and scented with the acrid bitterness of the aftermath of pure destruction, Spark ends on the same quiet unassuming note as it begins; with teardrops from above, a flash of light and glimmer of green hope, simply brilliant. A potent and compelling picture book useful for prompting discussions on natural disasters, Australian history, and looking at things unconventionally for older primary aged readers. Stick around for the next swag-load of Aussie titles coming soon.